25. Harper’s Weekly, July 10, 1873. 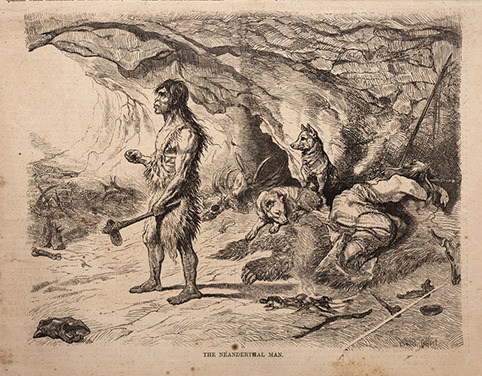 This appears to be the first attempt to recreate a Neanderthal man in a natural setting, complete with female companion and two domesticated dogs. It is signed by Ernest Griset (1844-1907), a well-known Victorian illustrator. Whether he relied on any professional collaboration for this restoration, or he did it on his own, in unknown. It is interesting that the cave woman is sleeping on a fairly good-sized cave-bear rug, and that a cave-bear jaw lies near the entrance to the shelter. 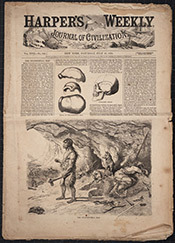 The confrontation between cave bear and cave man will be a recurrent theme in early restorations of prehistoric life (see the wall panel, The Age of the Cave Bear”).